A colophon records that this Bible was written in 1254 by William of Hales (perhaps from Hailes, in Gloucestershire?) for Thomas de la Wile, who had been called by the chancellor of Salisbury to be in charge of the Salisbury schools. The text was copied from a 12th-century Bible still in Salisbury cathedral library. 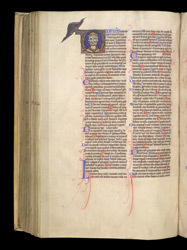 In the mid 13th century the city was an important centre of scholarship, and a number of fine illuminated manuscripts (probably produced there) can be attributed to the artist of the present manuscript, the so-called 'Sarum Master'. Psalm 109 is often illustrated in luxury Psalters with an image of the three persons of the Trinity: God the Father, God the Son, and the Dove of the Holy Spirit. Here the artist has instead represented the Trinity as a man with three faces.